For a plant that is almost extinct in its natural habitat, Tanacetum ptarmiciflorum has a lot to offer the gardener. It offers contrast in foliage colour and is very easy care. 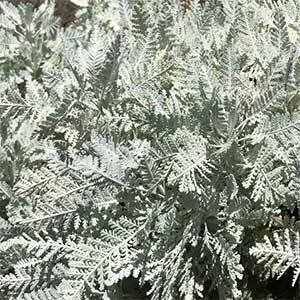 In the search for silver foliage plants this is one that should not be overlooked. It has very attractive silvery grey lacy foliage, hence the common names. It is also drought tolerant, easy to prune with the added bonus of white flowers. Plant Tanacetum ptarmiciflorum is a well drained soil and in a sunny position. Once established, it requires little care however will respond well to pruning which will help maintain a bushy habit. You can lightly mulch around the plant to retain a little moisture and prevent weeds. You could also use a little slow release organic type fertiliser each spring to improve growth a little.